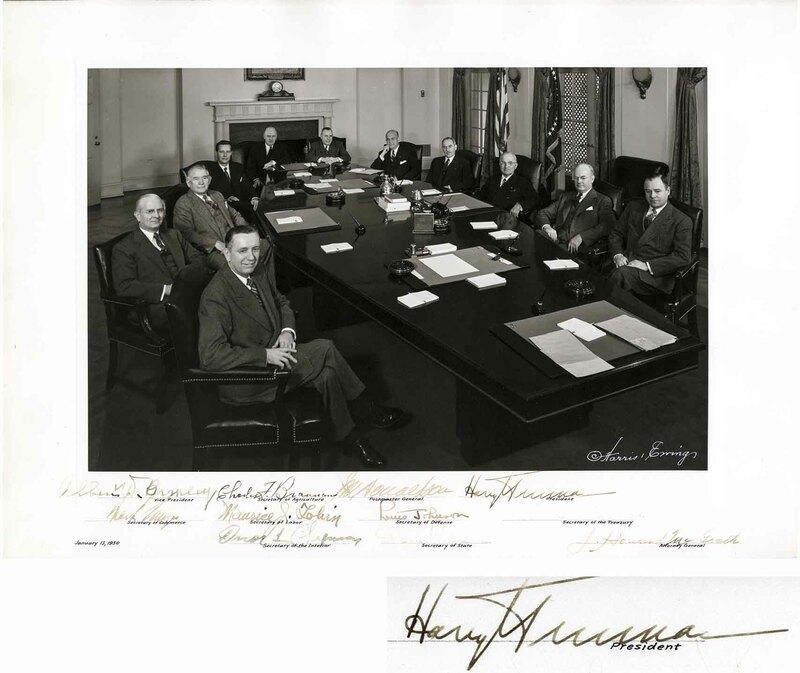 Harry Truman photo signed as President, along with the 10 men of his cabinet, circa early 1950. Boldly signed ''Harry Truman'' and additionally signed by Vice President Alben W. Barkley, Commerce Secretary Charles Sawyer, Agriculture Secretary Charles F. Brannon, Labor Secretary Maurice J. Tobin, Interior Secretary Oscar L. Chapman, Postmaster General Jesse M. Donaldson, Defense Secretary Louis Johnson, Secretary of State Dean Acheson, Treasury Secretary John W. Snyder and Attorney General J. Howard McGrath. Semi-matte image and photographic border measures 16.5'' x 12''. Fading to Acheson and Snyder's signatures, all others remain strong, especially that of Truman and Brannon, from whose estate the photo originates. Nicely preserved, in very good to near fine condition.